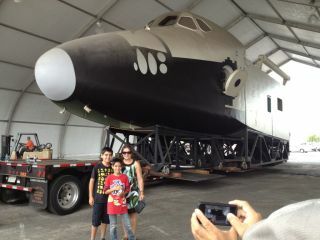 An unidentified family poses for a photo with the original space shuttle mockup after it was moved to a tent outside the Columbia Memorial Space Center in Downey, Calif., July 12, 2012. An original full-scale space shuttle mockup, which hasn't seen the light of day since the early 1970s, emerged from a warehouse into the Southern California sun Thursday (July 12) to be placed on outdoor display. The full-size wood and plastic model was transported on a flatbed truck the short distance from the building where it served for decades as a design and demonstration tool, to an open-ended tent that was erected in a parking lot near the Columbia Memorial Space Center in Downey, Calif. The city-owned center, which was named for NASA's first space shuttle after it was lost during its re-entry from orbit in 2003, is a hands-on educational facility located on the same historic site where the agency's moon-bound Apollo capsules and shuttle orbiters were built. "Having this exciting shuttle mockup attraction next to the Columbia Memorial Space Center will not only help further the space center's educational programs, but it will provide visitors with a unique experience that will help engage and inspire the next generation of explorers," Downey's mayor, Roger Brossmer, said in a statement. The shuttle sat in Rockwell's design and engineering room for more than 30 years, doubling as a public relations and visual aid during congressional and astronaut visits. After the Downey plant closed in 1999, the model was partially disassembled and moved into a corner of the building for storage. Thursday's move was to make room for the Tierra Luna Marketplace, a new $500 million retail development soon to begin construction by the Industrial Realty Group (IRG). When IRG acquired the former Downey aerospace design and manufacturing complex, its contract required that it keep the shuttle on site. Instead, the developer agreed to pay the city $100,000 to move the mockup elsewhere. The original space shuttle mockup seen after it was fully moved into a new outdoor display near the Columbia Memorial Space Center in Downey, Calif., July 12, 2012. IRG is leasing the shuttle's new outdoor lot to the city for $1 for the next two years. Downey officials said they hope to use that time to preserve and restore the space shuttle mockup by building a permanent facility for its display, a project that is expected to cost between $2 million and $5 million. "We are excited to have this historic shuttle [mockup] on display here in Downey," Mayor Brossmer said. "Our city is proud to have such a rich aerospace history and we hope that this is the first of several steps to getting a permanent home for our mockup." The shuttle will remain under the temporary tent until the city has the funds needed to construct the building, which will be located adjacent to the Columbia Memorial Space Center. City officials, together with the Aerospace Legacy Foundation, will seek sponsors to underwrite the display.